People Were Once The Strength of the Schuylkill River Towns; Can It Be That Way Again? I have just returned from my speaking tour of towns along the lower Schuylkill River. It was a fruitful visit; I learned a great deal, which I hope to integrate into my future posts. 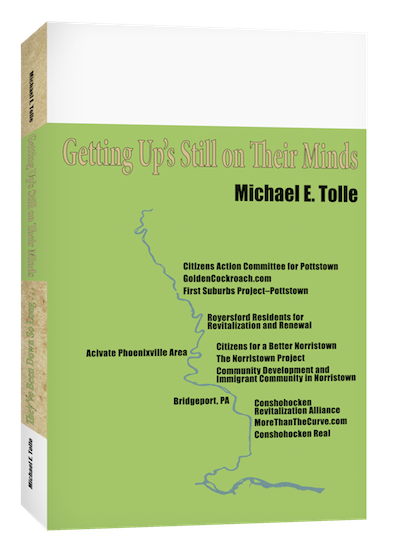 But in keeping with my current blog series on the impending revival of Norristown/Bridgeport, I’m going to briefly summarize what I said at the Montgomery County/Norristown Public Library on Wednesday, April 13th. 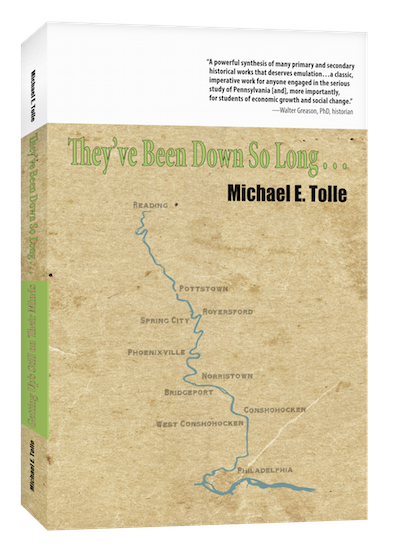 The entire history of the towns on the lower Schuylkill River can be summarized under three fundamental realities: The River, Transportation and People. The River underlies everything else, and that of Transportation has been responsible for the most dramatic and obvious changes in the river towns, but throughout their history it has been People that have been responsible for their growth and development. The river towns were what their residents made them. That was always true, remains true today, and will be true tomorrow. The period after the Second World War saw one reality—the River—begin its slow change toward the positive, from open sewer to scenic playground. At the same time, however, the reality of Transportation turned decisively against the old river towns. Once fully integrated into the rail network, they found themselves isolated from the new network of limited-access highways. Some still are, but Norristown/Bridgeport will, within a few years, gain a new connection. That connection will lead directly to the now clean river and its banks, now denuded of industries. Opportunity awaits there. The story of fundamental change to the River and to Transportation takes place largely after the Second World War. But the fundamental reality of People was the first to turn negative, back in the early decades of the 20th century. The First World War and then a reactionary U.S government virtually shut off the massive flow of immigrants to the United States that had characterized the late 19th century. By the late 1920s, a new immigration structure was in place, which attempted to freeze the numbers of each ethnicity that could enter in the future. This ended the waves of immigrants that had filled the Schuylkill River towns (among many others) during the 19th and early 20th centuries. During the decades that followed, the river towns suffered from this lockdown, but few realized it. Their residents became “Americans” but hyphenated ones. They retained their ethnic identity and continued the social isolation that always divided their towns. As the younger people left for the automobile suburbs, their world became steadily less representative of a changing America. This added to the isolation that the fundamental change in Transportation visited upon the river towns. This veneration of the past without the regeneration that had characterized the past via immigrants had a stultifying effect on the old river towns. This simultaneously hallowed the memory of their specific ethnic heritage while eliminating the memory that they all—or their parents—had been immigrants at some point. But The River now flows in a positive direction, and Transportation stands ready to direct bountiful interest to the common waterfront of Norritown/Bridgeport. But what about People? My motto—“that was then; but this is now, and things have changed”--reverberates on this subject, because much has indeed changed. But something that hasn’t changed—hostility towards immigrants—threatens to limit the potential benefits of this alignment. The periodic infusions of energy, hope and ambition in the new arrivals drove local prosperity during the 19th and early 20th centuries. After almost a century of stagnation, it is doing so again, particularly in Norristown. The new immigrants are Hispanics, those from Mexico in particular. Until quite recently, they were so few as to be uncounted. Today they are at least a statistical presence in every river town, but once again Norristown leads the way with the new immigrants. They constitute roughly one third of Norristown’s population. I consider this to be a great opportunity for Norristown/Bridgeport. Unfortunately, history is (sort of) repeating itself, because too many residents, forgetting their immigrant past, have chosen to view this as a burden on the town and make the same arguments that were applied to their own ancestors. Added to this is the dispute about “legality,” which certainly wasn’t a consideration back when the Irish and then the Eastern Europeans arrived on our shores. Almost the only way you could be denied entry was by individually possessing some unwelcome disease or condition, and unaccompanied minors were routinely allowed in. Of course, if you were trying to enter on the west coast, and you were Chinese or Japanese, things were different, but never mind that for now. But for too many, “legality” is only a convenient excuse to justify the traditional American dislike and distrust of “the other,” one of the less exemplary components of the American character. The legal issue can only be settled in Washington, but while we wait for a decision, why not take advantage of a situation that you can’t change? Why not accept—and assist—the people who want to work and contribute? Their potential vastly outweighs the negatives they bring, as it did for the Irish, Italians, Jews, and the many Eastern European ethnicities that preceded them. Don’t think so? Just walk down Main Street in Norristown, then do the same on West Marshall Street. The difference is starkly obvious. Main Street shows a few signs of life, but West Marshall Street is awash in new businesses, almost all of them Hispanic. Government—at any level—did not bring this about; people did. There is a lesson here about who is actually responsible for urban revival. What adds to—and can greatly multiply—this opportunity is the coincidental fact that Norristown, alone among the river towns, no longer possesses a Caucasian majority. In fact, it has no majority at all, only minorities—Caucasian, African-American and Hispanic—of almost equal numbers. The time when some could complain that that an oppressive majority was thwarting their progress is long gone. That excuse just doesn’t work any more. In truth, there are no more excuses. This new population balance makes Norristown a potential laboratory for the racial and ethnic reconciliation that will be required to take full advantage of the opportunity that the River and Transportation are delivering. Failure to follow this path will only limit—and may even abort—the potential rebirth that awaits both Norristown and Bridgeport. Two posts ago I observed that the significance of the Lafayette Street Extension Project lies in its two end points: the Pennsylvania Turnpike and Norristown’s riverfront. 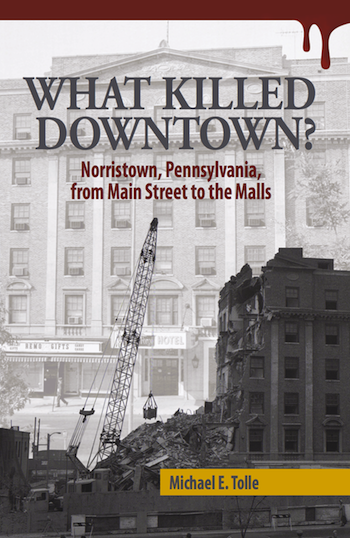 I focused on the first, recounting the contrasting experiences of Norristown in the 1950s and the Conshohockens in the 1980s to demonstrate how important such a connection can be. Now I take up the subject of the road’s other end, because it is at least as significant as the turnpike connection. That other end is close enough to Norristown’s riverbank to spur access—and thus development—along that stretch of town. That is exactly where the greatest opportunity lies. Yes, you want Main Street to revive, businesses to set up shop, and many other good things, but those things have a better chance of taking place if both towns make a riverfront makeover their primary goal. The biggest asset in the quest of Norristown/Bridgeport for revival is their riverfronts. Both towns stand to benefit from a historic reversal of priorities for the use of the floodplain along each riverbank. What used to be the lowest priorities are now the highest, and much of the floodplain now stands ready to accommodate that shift. Opportunity beckons to those towns that can take advantage of it. that’s already happening big time in the Conshohockens, but the efforts of Royersford and Pottstown haven’t had similar success. This demonstrates the importance of interconnection; in this case, specifically the connection to a limited-access highway, about which I have already written. Norristown/Bridgeport will possess that connection, so the future is bright. This historic change can work together with another—and closely interrelated--fundamental change, that of the river itself. The River was the first of the three fundamental realities of life along the Schuylkill River to turn positive for the towns along it. In “the good old days,” the Schuylkill River was little more than an open sewer; it carried vast quantities of waste products (from both industry and people), it smelled, and was altogether unhealthy. Aquatic life had pretty much been killed off. Cleanup was a slow process, one that moved by fits and starts during the first half of the 20th century, but began in earnest in 1945, when the Commonwealth began a project to dredge and clean the river. Several environmentally progressive projects and mandates followed, in attempts to tackle the waste at its sources. The mass closing of the river-polluting industries, which was otherwise very unwelcome, actually aided in the effort. The Schuylkill was proclaimed a “Scenic River” in the 1970s, and has steadily continued to improve in quality. One result of this fundamental change was a historic reversal of the housing priorities in the river towns. In “the good old days,” you measured the wealth of a river town family by how far away it lived from the river. Most workers had to walk, so residences were small, close together and not far from the factories. Those who could afford their own transportation, joined later by those who could afford the trolley ride, could extend the distance according to their financial circumstances. Drive around the river towns today, and see how the types of buildings in the different areas reflect this fact of history. In “the good old days,” the only people who lived along the floodplain were those who could not afford to live anywhere else. But the industries are gone, and all but a vestige of the railroads, with none upriver from Norristown that accept passengers. The only positive result was “buildable land,” which just happened to be in steadily more scenic locations, due to the improvement of the river. Today, we see the full extent of the change: people with money to spend (or invest) want to live as close to the river as possible and developers are accommodating them. The Conshohockens, which in addition to their transportation access happen to flank one of the most beautiful sections of the lower river, have demonstrated how popular—and profitable—this new residential priority can be. The riverfronts of Norristown/Bridgeport still hold much “buildable land.” What would best go where has many factors, perhaps the major one being the Norristown dam, and the difference it has on the river’s navigability. But new homes must not be the only consideration for developing a new waterfront. Another 180 degree reversal of the old priorities stands to benefit river towns. The only challenge to housing as the floodplain’s lowest priority during the “good old days” was recreation. If people didn’t want to live near the river, they certainly did not want to spend their precious free time anywhere near it either. Passage on or in an open sewer does not tempt those with money to spend on recreation, as the dismal record of the 19th’s century river-oriented businesses testify. Recreation on this scenic river—or in it—can now be undertaken safely. The Port Indian Regatta is only a memory, but muscle-powered competition is expanding, from traditional rowing to the decidedly non-traditional activity of Dragon Boat racing. But it is recreation along the riverside that has proven to be the most popular bringer of people to the Schuylkill Valley. The key to this exciting development was the existence of abandoned railroad track beds after the rails had been torn out, evidence that even disaster can bring unexpected benefits. These have turned out to be quite popular for bicyclists and those who want to exercise outdoors. The transformation began locally with the Philadelphia to Valley Forge Bikeway, and has expanded in both concept and extent. It is now the Schuylkill River Trail, and it passes right by Norristown’s riverfront. Today the Trail is a vital and increasingly popular lure to potential visitors (read “spenders”), and will be so for potential residents (read “those who spend even more”). Bridgeport has the Chester Valley Trail coming, plus—hopefully—the “Bridgeport loop trail” to connect it with the Borough’s riverfront and to the Schuylkill River Trail. Again, it’s all about interconnection. The real keys to the revival of an old river mill town? They are all there along the riverfront, in an admittedly raw—or even potential—form, but there nonetheless. So this is where I conclude by promoting yet another badly needed interconnection, a purely political one, inspired by a common plight and a common way out. People will pay good money to live along a scenic river; the Conshohockens demonstrate that. But what will the new river residents in Norristown have for a view? The Borough of Bridgeport, of course, which does somewhat lower the scenic level of the river along it. By the same token, of course, potential new residents along the river on the Bridgeport side would have a view of Norristown, which can be argued is better, but hardly ideal. Thus revival must be a joint effort; both towns possess much the same general opportunities, for mostly the same reasons, because they lie directly opposite each other on their common reason for existence, the Schuylkill River. One of the limits to their potential rise could be the one they place on themselves by thinking only of themselves.